Easy to assemble. Requires Xacto knife, fine sandpaper, white glue. Lovely three shelf plate display features finely detailed fretwork sides, (fretwork design differes from style #1) and cutout top rail. Shelves are routed to allow plates to stand easily. Can be stained, painted, or left natural and sealed. Laser cut shelf edging included! PS. 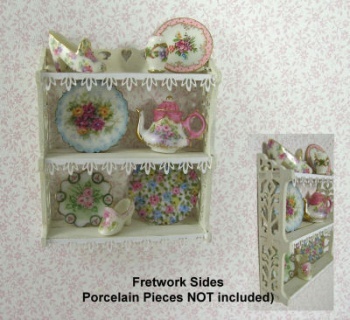 Porcelain pieces shown are from my personal collection and are not included! !